In Your Embrace – Page 3 – be, jesus, our joy! Do you ever think about the hidden life of Jesus? I remember my postulant master, Fr. Robert of Divine Mercy, observing once that the Lord had lived 30 years in obscurity and obedience to Mary and Joseph before the 3 brief years of his public life. The hidden life of Jesus: hidden, that is, under the veil of the ordinary, the domestic—unrecorded because who, in dusty Galilee long before the days of Instagram, would have thought it was worth writing down? Lately I have been feeling drawn to these thirty hidden years in the life of the Lord. And I can&apos;t help but remember my favorite scene in The Passion of the Christ—maybe you know it—where Jesus is working on a table, and Mary comes to ask if he is hungry. They joke around; he splashes her with water; she laughs in surprise and the inexpressible delight of a mother who loves to be loved by her son. That&apos;s all. A quiet day in Nazareth. How many days must the Lord have spent like that: His sacred hands busy with woodwork til sundown, a rhythm of prayer and work, play and work, eating his mother&apos;s cooking, practicing his foster-father&apos;s trade? Would those days have seemed endless in the Galilean summer? Or did he treasure each one of them, unutterable, unrepeatable wonder, glory of God in time? At the end of this long winter, on the threshold of spring, I left my "Mount Carmel" in Silicon Valley to return to Portland, and for 14 weeks since, I have been laboring quietly in this mission ground the Lord has called me back to. I say "quietly" because, like Jesus&apos; tables, much of what I have done this summer at St. Stephen&apos;s parish will never be known or remembered by anyone but God alone. How much time have I spent in finance council meetings, organizing files, sorting mail and answering phone calls—putting out tables and chairs for this or that event, setting up for hundreds of Masses, weeding flowerbeds, deadheading roses! Yes, the hidden life of Jesus and our great saints "hidden with Christ in God" should be examples for us, teaching us how to consecrate the everyday and the mundane to the eternal glory of the Trinity. But what about when we find ourselves lacking in love? "Love turns work into rest," says St. Teresa of Jesus, and rightly so—but when love is lacking, it seems like even rest turns into work! The answer, of course, is to humbly begin again. We fall and get up. We fall and get up again. I cannot tell you how many times this summer I have been humbled to recognize my own lack of love, the frustration bubbling over in my heart at having to change all the altar cloths for the third time that day, or the wounded pride flaring up at some minor correction I&apos;d received, or the self-righteous anger at having my prayer interrupted by some minor request that so-and-so really could have done himself faster than coming to ask me, and don&apos;t you know I&apos;m trying to become a saint here? !—recognized it, I say, and begun again. "Lord, let me love you with your own love." That prayer is the heart of it all. The moments that I have felt most "like a priest" in the parish have been those moments, quiet, personal, with just one or two others, when I am faithful to the movements of the Holy Spirit and allow Him to put certain words on my lips, or to move me, unimpeded for once by my pride and stubbornness, to approach somebody, to go out of my way, to touch, to listen. When Immanuel is with His people through me as His instrument. When I spoke some words to a woman in pain, words which I never could have devised or known to say on my own, and she cried and then said, pointing right at my heart, "There&apos;s a father in there. I can see it." Those moments, by their very nature, are few, fleeting, hidden. The hiddenness is the beauty of them, the intimacy is the majesty. A year or two ago I remember writing a poem reflecting on my ministry assignment at that time, which was, principally, washing the floors and stocking the shelves at a food pantry, but on this particular occasion my partner and I were asked to put together some chairs (a task I repeated several times this summer in the rectory!) and break down some old furniture that was beyond repair. "How much of ministry / is knowing when to break / and when to build?" the poem began. "How much is simply saying &apos;yes&apos;? / How much is nothing more / than being there / when you are broken down by a stray blow?" I don&apos;t claim that poem is very good—certainly it has no great artistic merit—but those last lines echo in my heart as I pray over my time in the parish this summer, reconsecrating everything that I have done here to God and offering it all back to Him in praise and thanksgiving for His goodness to this poor sinner. As seminarians, we live six or eight or ten years in our own Nazareths, a blessed rhythm of prayer and work, play and work, learning our fathers&apos; trade: the care of souls. (How much I have learned from two good and holy priests this summer! Not "book learning"—that could fill a teaspoon, maybe—but the ways they have formed me will shape the rest of my life as a priest and a Christian man.) We live our hidden lives, learn our philosophy and theology, make our little hidden acts of virtue, touch a few hearts here and there (if we let God touch them through us, that is)—and all the while being formed and shaped, as the potter continually molds the clay on the wheel. All the while, though we don&apos;t notice it as the moments and days and years slip by, being transformed: "from grace unto grace and glory unto glory." Almost as soon as my assignment ended, I left on a road trip to visit friends in California, and the highlight of this trip has been visiting my old monastery (how strange it feels to say that!) for a couple of days. In so many ways, it felt as if I had never left. I came right in the back door as if I had only gone for a walk that afternoon, rather than flown home four months ago. (Bella, the dog, jumped all over me like she thought I was never ever coming back, but then again, she used to do that every time I came outside even if I&apos;d only been gone 5 minutes!) I sat in my old choir stall in the chapel, I helped the brothers set up and clean up for meals, we all rode in the van together to a Melkite Catholic Church for Divine Liturgy on Sunday morning, and we all watched a movie together until late Sunday night. The singing in the liturgy was still horribly off-key (not helped one bit by my presence!) The brothers were still telling the same jokes they had been in April, I pointed out in mock exasperation. Had I dreamed this whole summer? Would I look down and see I was wearing a brown tunic and scapular again instead of my black cassock? But even though all the externals were exactly the same, this visit felt deeply different to the months I spent in Carmel as a postulant and novice. On the day I decided to leave back in April, I wrote exuberantly in my journal—the page practically glowing with joy—that I felt like I had gone "from the condition of slavery to the condition of freedom." What was different in this visit to my old monastery? Me. I am different. No longer the seminarian who visited a year ago, longing to know and love God deeply and to live the spiritual life intensely, ready to plunge into Carmel both feet first! No longer the novice who was determined to persevere in the darkness and the dryness of the interior desert, seeking the Beloved of my soul, even though at every turn I found my heart was pounded more deeply into the dust. Through the many twists and turns of this year—from Mount Angel to Mount St. Joseph to the parish of St. Stephen, now again (if only for a brief visit) to Mount St. Joseph, and soon again to Mount Angel—God has been revealing to me where and how He desires me to live. I am still figuring it all out, of course. What the Lord has revealed in this year will continue to deepen in me in the years to come. But both externally, and in an invisible, interior way, I am now precisely where God wants me to be, and I can take comfort in that, can put down roots securely and confidently in that, can flourish in that!—can accept the hidden life I am living now, and make my little hidden acts of virtue, because I know that God, who is Love, has called me to this—and what more could I ask for? Header photo credit: John Ivezic, St. Stephen Catholic Church, Portland, OR. Posted on June 30, 2017 June 30, 2017 by Matthew K.
Bonus: the most beautiful Kyrie I have ever heard, sung by Serbian Orthodox musician Divna Ljubojevic. Pray for unity in the Church! The East is such a treasury of beauty for the glory of God and the salvation of souls. How true that “the Church must breathe with both lungs”—East and West, mystical and prophetic. Distressed by exile or sickness, the soul recounts God’s infinite kindness and is calmed by the knowledge that its merciful Father in heaven is loving and forgiving and can effect any redemption or cure. Bless the LORD, O my soul; blessed art Thou, O LORD! Bless the LORD, O my soul, and all that is within me, bless His holy name! Bless the LORD, O my soul, and forget not all that He hath done for thee. Who is gracious unto all thine inquities, Who healeth all thine infirmities. Who redeemeth thy life from corruption, Who crowneth thee with mercy and compassion. Who fulfilleth thy desire with good things; Thy youth shall be renewed as the eagle’s. The LORD performeth deeds of mercy and executeth judgment for all them that are wronged. He hath made his ways known unto Moses, unto the sons of Israel the things that he hath willed. Compassionate and merciful is the LORD, long-suffering and plenteous in mercy. Not unto the end will He be angered, Neither unto eternity will He be wronged. Not according to our iniquities hath He dealth with us, Neither according to our sins hath He rewarded us. For according to the height of heaven from the earth, the LORD hath made His mercy to prevail over them that fear Him. As far as the east is from the west, so far hath He removed our iniquities from us. Like as a father hath compassion upon his sons, so hath the LORD compassion upon them that fear Him. For He knoweth whereof we are made, He hath remembered that we are dust. As for men, his deeds are as the grass—as a flower of the field, so shall he blossom forth. For when the wind hath passed over it, then it shall be gone, and no longer will it know the place thereof. But the mercy of the Lord is from eternity, even unto eternity, upon them that fear Him. And His righteousness is upon sons of sons, upon them that keep His testament and remember His commandments to do them. The LORD in heaven hath prepared His throne, and His kingdom ruleth over all. Bless the Lord, all you His angels, mighty in strength, that perform His word, who hear the voice of His words. Bless the LORD, all ye His hosts, His ministers that do His will. Bless the LORD, all ye His works, in every place of His dominion. Bless the LORD, O my soul! Glory to the Father and to the Son and to the Holy Spirit, both now and ever, and unto the ages of ages. Amen. Bless the LORD, O my soul, and all that is within me, bless His holy name! Blessed art Thou, O Lord! Once, alone late at night with the Blessed Presence in the chapel, I wrote these lines: “How often I waste so much energy trying to seize hold of the gifts you are giving me, Father. As if a man could hold the ocean in his hands. They say you give and you take away … I think, God, you always give. Your very nature is pure gift. But you give like the ocean gives to the shore. The ocean lives and forms the shore because it is in motion! If it were still it would not be the sea. It would be a lake, a pool, a pond. But it is in the nature of the ocean to crash against the rocks: to go in and out, in and out, reaching almost to the treeline, then receding again past the edge of the sand. That prayer speaks as powerfully to my heart today as the hour I wrote it. It is also a prayer which the Lord answered, radically, in bringing me to Carmel. I have written before about how the whole movement of my discernment and decision to enter the Carmelites was one of growing detachment: first realizing the tangled web of attachments which bound my heart and prevented me from walking in freedom to follow God’s will, and then trusting God enough to put into his hands all those things I most dearly wanted to cling to. “Does it make any difference whether a bird be held by a slender thread or by a rope,” writes our holy father St. John of the Cross, “while the bird is bound and cannot fly till the cord that holds it is broken?” In the same way, it made no difference that the things to which I discovered I was desperately attached were good things which God had given me—my family, my diocese, my seminarian brothers, my archbishop, and my dreams of future priestly ministry, to name a few. (Of course, there were plenty of other, lesser attachments to other, lesser goods. I confess I was pretty attached to my car, my iPhone, and my Facebook account!) But as long as I had even the slenderest thread of an attachment, I was bound: I could not fly. Yet I could not have imagined the extent to which God would continue stripping my heart in the weeks and months to come. The work He had in mind for me was not done in a moment, when Fr. Robert and the other four postulants showed up at my door that bright morning in January and whisked me away to San Jose. Very soon after the beginning of my postulancy, I was plunged deep in what Fr. Ian Matthews so rightly calls “healing darkness,” that total desolation of spirit in which God is united to the soul at a level deeper than one can sense. As a result, the soul experiences His very closeness as darkness, dryness, aridity, desolation, disconsolation, doubt, abandonment. Stripping away the clothing: now that was the easy part, leaving behind the externals, the distractions of the world, when I stepped out of the diocese and into Carmel. In the postulancy, He was cutting through skin and muscle. I often felt like God was continually humiliating me, the youngest postulant and the “lowest of the low” in the monastic community (one night I came to him in the tabernacle and said, a little indignantly, “Will you just give me a break? !”)—but slowly I began to accept the mortifications to my pride. I had none of the familiar supports I was accustomed to in the seminary, no close friends to talk to, no freedom to get in my car and leave for an afternoon when things were tough, no busy work to distance me from the real work taking place within, not even the material comforts which used to distract me: nothing to lean on but sheer faith that His will was being accomplished in me. And without a doubt, it was. I often remembered a phrase which one of my Carmelite brothers in the seminary had mentioned to me during my discernment: “Sometimes God takes us by another way for a while so that we can gain something we never could have gained otherwise, or lose something we never could have lost.” So much interior healing took place in me, in such a relatively short span of time, that just could not have happened so quickly or so directly any other way. The stripping away revealed deep wounds in me which I had forgotten, or ignored, or never seen so clearly as I did then. I realized how many sins and imperfections had their roots in those wounds, like foul weeds which had taken root in damp, dingy holes in the earth. And as I grew in this kind of self-knowledge, all by the mysterious interior illumination of the Holy Spirit, I felt—not despair—but a new hope and a deeper certainty of being beloved by the Father than ever before. For so long I had tried to build over those wounds in the core of me, so as not to face the reality of my brokenness, and to build my identity on something other than my true foundation. In order to free me, God had to remove everything I could try to use as a false foundation. Then, faced with the truth of my being, I had nothing left to rely on but Him. I decided to make a general confession, a whole life’s worth of sins and imperfections and wounds and broken humanity, which I wrote down on 10 pages in a notebook and then read shakily to my spiritual director over the course of an hour on a secluded porch in sunny Cupertino, who at last absolved me of my sins, in the name of the Father, and of the Son, and of the Holy Spirit, amen, thanks be to God! And as I drove back to the monastery after our meeting, I felt such a sense of victory, of a deeper interior freedom than I had ever felt before. Detachment, stripping, healing, freedom: those were the watchwords of my postulancy. I did not feel at peace, exactly, but beyond a doubt I could feel I was growing. Furthermore, the sufferings and the trials seemed like the surest proof that it was God’s will, because of the good fruit they were bearing in me already. My postulant master advised me to “get comfortable on the cross,” to lean into the sufferings and find a position where I could hang there and endure, so that was the attitude I adopted: trusting endurance, loving perseverance. Sure enough, after the initial excitement of being clothed in the habit and receiving my religious title, Bro. Matthew of the Incarnation, the dark night set in again. At first, it was similar to what I had experienced in the postulancy. But after a couple weeks in the novitiate, I experienced the most intense darkness I ever have. It seemed to me as if it was of a different character than the healing darkness I had experienced before: I felt completely abandoned, confused and disoriented, as if God’s grace were suddenly and absolutely absent from my soul, and I was doing everything by my own strength (and doing it badly!) Even little things like making conversation at meals, going to recreation, or sitting down to do my spiritual reading were suddenly exhausting, and I could hardly muster a few words to the brothers or settle down and focus for a couple of minutes at a time. I dreaded doing anything. I couldn’t even fall asleep at night… Nothing gave me any pleasure or peace. Though at first I remained determined to persevere, after just a couple of days of this all-encompassing darkness, I was absolutely convinced that I could not continue unless God gave me a lot more grace! The intensity of the desolation revealed to me my absolute weakness, my utter inability to do anything without Him. But I was determined to keep going and, above all, not to make any rash decisions in such a time of desolation, as St. Ignatius of Loyola wisely counsels. In the end, the “storm” did begin to clear. I began to get the tiniest taste of peace again—just enough to carry me through the day. I put back on the habit, which I had felt such an overwhelming aversion to during this desolation that I had hardly worn it for 3 days. I started to think, “OK, I guess I can continue…technically, I can keep doing this…” for as long as God keeps giving me the strength. But in that thought of remaining in Carmel, there was such dread and disappointment, such a feeling of resignation, disquiet, unhappiness which accompanied it. I realized I no longer had any desire to live this life: there was no more water in that well. And even as I prayed again for God’s holy will to be done, abandoning myself once more to His providence, I had to acknowledge how much I wanted to leave, how any desire to stay in the monastery had completely left me—praying with a sincere heart “Your will be done,” yes, but honestly admitting, too, that the thought of staying any longer felt like an unbearable imprisonment! I spoke with one of my brother novices, a very insightful young Carmelite who will make a great spiritual director one day. We had both been diocesan seminarians at Mt. Angel together, both discerned Carmel together, both applied and entered at the very same time, so he has known me from the beginning of our journey. Well, that afternoon, we walked through it all again. He pointed out the consistency of God’s calling me from my first conversion, my desire for truth and for love which eventually led me to the Church, and which continued developing in me and leading me up to the seminary. He could see it in our time in the seminary together, even just the one year he knew me there: going from grace to grace, as the Lord transformed me, bringing me into positions of leadership and authority, to a mature “pillar of the community,” as he put it. And he could see that in my discernment of Carmel: consistency, building upon everything that had gone before. He mentioned how struck he had been, getting to know me at Mt. Angel, by how I had my heart set 100% on my vocation to diocesan priesthood: how I was “all in”! 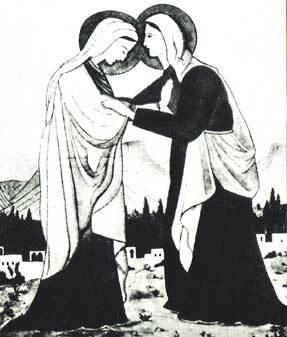 As we discerned Carmel together, he could see that same determination and fervor: my heart was all in it, set on Carmel. And he’s right! It was. I fell so completely in love with the life of contemplative prayer, both the practice of mental prayer and the living of a life so suffused by prayer, with the goodness of the friars and the desire to be like those fine men; Bro. Dustin was right: my “heart was set” on Carmel. Once I encountered the Carmelite life, there was no way I could not aspire to live it, to give myself radically and fully to it! And there was no way I could continue in my former desire and zeal, as a diocesan seminarian, once I had given my heart so unreservedly to Carmel. It was that new and incipient sense of mission, a pure gift of grace, which really convinced my heart. And when I realized and accepted that it was time for me to leave Carmel—not fleeing from desolation or trial, not saying no to the purifications or to my share in the Cross, but rather, saying YES to this new interior illumination of God’s will—there was such a deep and immediate inner shift in me: from the condition of slavery, of one struggling to survive (yet alone thrive!) in the monastery, to the condition of freedom. As I said to my brother that afternoon, there is really no other way this could have gone: not with me being who I am, and God being who He is. So do I count my months in the monastery a loss, or my leaving a failure? No, and no! I thank God for what I take with me from my time at Mt. St. Joseph: a renewed zeal for my vocation in the Archdiocese of Portland; a deeper sense of that vocation and what it means (to live the spirituality of Carmel in a diocesan context); a real sense of mission (to teach the people of Portland, by word and example, the wisdom of Carmel, which is really nothing more nor less than the authentic spirituality of the Church: the way of prayer—the way of love!) By giving up everything I could to follow God’s will, in the honesty and simplicity of my heart, now I am able to take those things back up with an open hand, using the gifts He gives me without setting my heart on them. (I remember another scrap of a phrase someone told me once: “Sometimes God asks for everything, but He doesn’t take it all.”) Those months in the darkness of the postulancy allowed me to recognize, too, so many interior weakness and imperfections and wounds, to grow so much in faith and humility, and to experience such immense graces of interior healing and illumination. So I sing “glory be to God!” for my time in Carmel—and now, having read the wind and the waves and the stars overhead, it is time to correct my course. Two weeks ago, I left San Jose to return to the Archdiocese of Portland. In another week, I will be starting a summer assignment at St. Stephen’s parish in Northeast Portland, easing back into diocesan life. This fall, I will be returning to Mt. Angel for my fourth and (pray God!) final year of college seminary. I am beginning to attend the meetings of the Secular Carmelites in Portland, to explore what it will mean for me going forward to live as a Carmelite in a diocesan context. So it is I can say again, in those marvelous words of St. Junipero Serra, “¡Siempre adelante; nunca atrás!” I humbly ask your prayers for me as I continue in my formation and discernment. In particular, please pray for many more vocations to the California-Arizona Province of Discalced Carmelite Friars, as well as our own Archdiocese of Portland, and for all the novices and seminarians who are currently in formation. May the Lord raise up many faithful laborers in His vineyard—wherever and however they will best serve Him! And may we be zealous to discover His will for our lives, listen intently to the movements of the Holy Spirit, and never hesitate to follow where He leads. This is part 6 of QUO VADIS? – a series on my own discernment of the Lord’s call to priesthood. Go here to view all posts in the series. Header photo credit: Fr. James Geoghan, O.C.D.